The first casualty of war is innocence. 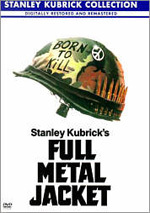 Winner of 4 Academy Awards, including Best Picture, and based on the first-hand experiences of Oscar-winning director Oliver Stone, Platoon is a movie "that regards combat from the ground level, from the infantryman's point of view, and does not make war look like fun" (Roger Ebert). Powerful, intense and starkly brutal, Platoon is "harrowingly realistic and completely convincing" (Leonard Maltin) from beginning to end! Chris Taylor (Charlie Sheen) is a young naive American who arrives in Vietnam to quickly discover that he must do battle not only with the Viet Cong, but also the gnawing fear, physical exhaustion and intense anger growing within him. As the fierce battle rages around him, his two commanding Sergeants (Oscar-nominated Tom Berenger and Willem Dafoe) draw a fine line between the war they wage against the enemy and the one they fight with each other, dangerously dividing the loyalty of the men. The fighting within, around and everywhere permeates Taylor, suffocating his realities and numbing his feelings to man's highest value ... life. Platoon is "a dark, unforgettable memorial" (The Washington Post) to every soldier whose innocence was lost in the war-torn jungles of Vietnam. $241.080 thousand on 6 screens. When Platoon hit my local theater in early 1987, it caused an immediate reaction. The film did enormous business in my area, though since it only played at one theater in Charlottesville, Virginia, so that wasn't tough. It also really impressed the people who saw it. I recall all of the buzz about what an intense and harrowing experience the film provided. My friends and I checked it out one evening, and I found myself rather unimpressed. To be sure, the movie had its moments, but overall the whole seemed like less than the sum of its parts. There was something lacking in the total picture, I felt. And I still pretty much feel the same way. I've seen Platoon at least four times since 1987 and it remains a moderately compelling but inconsistent film. A lot of that stems from the usual problem I have with Oliver Stone's movies: the guy isn't exactly subtle. Although many regard the film as the most honest and intense made about the war in Vietnam, I think Stone's agenda interferes with that basic truthfulness. In a nutshell, he tries too hard to make the events perfectly emblematic of the conflicts involved with that dispute. Stone neatly gives us "good" in the character of Elias (Willem Dafoe, apparently practicing to play Jesus in The Last Temptation of Christ) and "evil" through Barnes (Tom Berenger). These two are constantly at each other, and guess who wins? Well, I won't say, since it might spoil it. Actually, that question seems slightly up in the air, since the film largely acts as a contest between the two for the "soul" of new recruit Chris Taylor (Charlie Sheen). He behaves as the "everyman" in the troop, and therefore represents the basic thoughts and desires of the US as a whole. Or something like that. Platoon skitters about quite a lot and it'shard to pin down much of the time. On one hand, it seems to avoid a coherent narrative, which seems logical in that a confused, random sequence of events might best encapsulate the nature of the war. On the other, it goes to pains to set up this aforementioned morality play, and seems a bit stilted at times as it works its way through this plot. Perhaps my opinion of Platoon remains affected by my initial anticipation. After all of the acclaim that's come its way, I still expect it to be the most harrowing war experience shown on film, and I simply don't think it comes close. I'd take the battle scenes in Saving Private Ryan or Apocalypse Now over any here. Also, though it portrays no actual fighting, I still think Sophie's Choice provides the most devastating war-related production I've seen. That shouldn't take away from the effectiveness of Platoon, but it does, at least to me; since it's supposed to exceed all comers and doesn't, I can't help but think less of it. Nonetheless, it is a fairly well-crafted and executed movie. The characters are fairly thinly-drawn, even among the bigger roles, but the actors flesh them out relatively well. Berenger deserves particular notice as the nasty and cruel Barnes. He doesn't provide much humanity in the part, but he makes the role effectively evil. Dafoe is a little too beatific as Elias, but he still seems well-portrayed, and Sheen offers some acceptable work in his pivotal role. Ultimately, I think Platoon remains a solid film that does a fairly good job of portraying the horrors of war, but I continue to be somewhat underwhelmed by it. Throughout much of the movie, I felt like I was supposed to be awed and devastated but those impressions never actually occurred. In the end, I'd place it in the middle of the famous Vietnam films. It doesn't approach the greatness of Apocalypse Now - the first two-thirds of that film, at least - but it easily surpasses the dullness and pretentiousness of the radically overrated Deer Hunter. 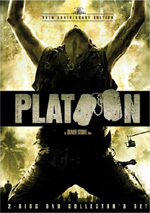 Platoon appears in an aspect ratio of approximately 1.85:1 on this single-sided, double-layered DVD; the image has been enhanced for 16X9 televisions. This 20th Anniversary release of Platoon offered moderate visual improvements when compared to the 2001 special edition and 2000 movie-only release. One consistent positive came from the image's sharpness, which seemed very good throughout the movie. Only slight instances of softness occurred, and these remained minor. The majority of the film was detailed and distinctive. I saw no jagged edges or shimmering, and just a smidgen of edge enhancement occurred. While the prior DVDs suffered from a fair number of source flaws, this new one cleaned up matters a bit. I still noticed scratches, speckles, and a few hairs during the first five minutes, and a smattering of defects continued to appear through the rest of the film. However, these decreased from what I detected in the earlier DVDs; this was a cleaner presentation. Colors tended to be fairly subdued, but they looked natural and well-saturated. Other than some of the reddish tones in the "Feel Good Cave" - which could come across as a bit murky and heavy - hues seemed accurate and precise. Black levels appeared appropriately dark, but shadow detail was a minor weakness, in large part due to the apparent use of "day for night" photography at times. Though I noticed too many problems for the 20th Anniversary Platoon to enter “A”-territory, it moved up to a firm “B+”. Although the 20th Anniversary DVD added a DTS 5.1 soundtrack to the prior Dolby Digital 5.1 mix, I didn’t detect any improvements in that category. The DTS version was a little louder than the Dolby one, but otherwise they sounded identical to me. I also thought the audio here duplicated what I heard on the earlier DVDs. On the positive side was the film's soundfield, which seemed surprisingly active for a movie from 1986. The front speakers were used to good effect, as a lot of action popped up in all three channels. The rears also got a decent workout. Though their general demeanor was to reinforce the front spectrum, the surrounds still added a nicely involving dimension and also provided a fair amount of unique audio; the latter generally regarded some showy helicopter effects but also encompassed other elements. I found the mix to be a little too "speaker specific" at times, and it didn't blend especially well, but for its age, it seemed well above average. Unfortunately, the quality of the sound caused some concerns. In general, it felt as though the dynamic range was limited, and when the audio wanted to go above or below a certain point, it appeared rough and thick. Dialogue displayed the most problems; although much of the speech was relatively natural, a great deal came across as flat and harsh. Intelligibility remained fairly strong, however; the only times I had trouble understanding dialogue related to the cacophony of the situation. Effects seemed similarly restricted. Due to the many explosions we hear, there's a mild amount of distortion from this track, and the high end never seemed as crisp or clear as it should. Bass also was present but it seemed somewhat insubstantial. Only Georges Delerue's poignant score emerged from the mix unscathed; it appeared pretty clean and smooth and seemed to replicate the music well. Platoon earned its "B" through the quality of the score and the ambition of the mix, but the reproduction of speech and effects sounded slightly disappointing. Although the 2001 Platoon offered a nice set of extras, this “20th Anniversary Edition” adds to that package. Everything from the 2001 release shows here as well as plenty of new components. I’ll note new elements with an asterisk, so if you don’t see a star, it also appears on the 2001 set. On DVD One, we find two audio commentaries. First up is a running, screen-specific piece from director Oliver Stone. Old Ollie usually provides a compelling experience with these tracks, and the piece for Platoon was no exception. Although I always knew that Platoon was a personal flick for Stone, I never realized just how personal until I screened this commentary. Throughout the track, Stone often discussed the real-life counterparts for scenes and characters. It was fascinating to hear of his actual experiences and discover just how much of the movie came from Stone’s life. Of course, much of it was fictionalized, but I was surprised to find out how much duplicated Stone’s tour in Vietnam. Stone also provides a lot of interesting information about the day-to-day problems he had while at war as well as some tidbits about the making of the film itself. The latter aspects of the commentary are pretty minor, however, as Stone’s main emphasis sticks with his past. He even occasionally refers to Charlie Sheen’s character as “me”! At times, Stone did little more than simply describe the action on screen, but as a whole, this was a very interesting track. In addition, we get a second commentary from Captain Dale Dye, the technical advisor for Platoon. I found this piece to also work very well. 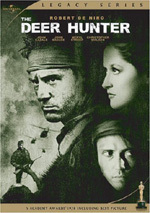 During much of the track, Dye discusses the training through which he put the cast, and he covered the ways in which he and Stone tried to ensure that the movie would accurately represent the actual war experience. Dye includes a lot of compelling factoids throughout the track, and he also went into his own combat memories, though not to the same degree as did Stone. In any case, the second commentary provided a nice complement to Stone’s and it was an interesting listen. As we shift to DVD Two, we start with 12 *Deleted and Extended Scenes. These fill a total of 11 minutes and 31 seconds. “Chris’ First Time” shows his initial attempt to smoke pot, while “Love and Hate” tells us more about Barnes and Elias as well as the grunts’ motivations. “Dream Sequence” depicts a short nightmare of Chris’, and “No Regrets” offers a chat between Chris and Elias about life and death. “When I Get Home” tells us what the soldiers plan to do when they return to the US, and “Look for a Target” is a brief snippet in which Barnes yells at the grunts during combat. “Rescuing Lerner” shows what the title indicates, while “Life of the Party” mostly presents King as he sings “Tracks of My Tears”. “This New Guy” and “Later” connect to King’s departure, though the latter shows a creepy possible reappearance of Elias. “Barnes Lives” provides an alternate sequence in which Chris doesn’t kill the sergeant. Much of this added material offers additional philosophical comments from the soldiers. These threaten to turn Platoon into The Thin Red Line, so I’m glad they got the boot. The clips also deflect the focus from Chris too much. He’s in them but they broaden the movie’s scope to more heavily involve the other grunts. However, King benefits from this, and the scenes may help us better understand the closeness of his relationship with Chris. The released film doesn't explain that very well, so at least they open up that side of things a little better. I prefer the movie without them, but one could argue for their inclusion. We can watch these with or without commentary from Stone. He tells us a little about why he cut the scenes and also provides more information about the real-life inspirations for the characters and situations as well as notes about the actors. Stone proves involving and useful in his remarks. After that we find a collection of documentaries, most of which are new to this set. *Snapshot in Time: 1967-1968 goes for 19 minutes, 14 seconds with movie clips, archival materials, and interviews. We hear from Stone, Dye, author Philip Caputo, UCLA history professor Mary F. Corey, former senator Max Cleland, and Harvard University senior fellow Marvin Kalb. “Snapshot” examines the world during the period covered in Platoon. We get background about the Cold War and the “Domino Theory”, the war in Vietnam and US involvement there. The show also looks at the contrasting combat styles between the Americans and the Vietnamese along with other problems during the war. We see the development of the conflict across 1967-68 and also watch influences on the home front like media coverage and protests. Obviously a program that runs less than 20 minutes can’t offer a terribly deep examination of a subject as broad as the Vietnam War, even if it sticks with a two-year span. That said, “Snapshot” does well for what it attempts. It touches on the most important issues and gives us a good feeling for the significant concerns of the period. *Creating the ‘Nam runs 12 minutes, three seconds and features Stone, Dye, producer Arnold Kopelson, editor Claire Simpson, production designer Bruno Rubeo, special effects supervisor Yves De Bono, and actor Charlie Sheen. While “Snapshot” looked at the historical perspective, “Creating” examines movie production issues. It starts with the beginning of the shoot and discusses Stone’s mindset following the failure of Salvador and the strain creating Platoon put on him. From there we hear about what it was like to work with Stone, locations, sets and making the Philippines look like Vietnam, extras, the flick’s visual style, authenticity, and various production complications. No one will mistake “Creating” for a full “making of” program, but it touches on a variety of useful issues. It gives us frank opinions of areas and moves at a good pace. As expected, there’s some repetition with other elements, but this remains a tight little show. For the 17-minute and 18-second *Raw Wounds: The Legacy of Platoon, we find information from Stone, Sheen, Dye, Simpson, Kopelson, Cleland, Caputo, Corey, film critic Jack Mathews, NYU associate professor Marita Sturken, USC School of Cinema-Television Dr. Todd Boyd, and Vietnam veterans John Greer, Randy Dillenback, Willie Wong, and John Serrano. As implied by the title, this show looks at what Platoon meant to people and the impact it made. We hear a little more about the film’s development and the impressions of those involved as they created it. From there we hear about public reactions to the flick – both pro and con – along with reviews and interpretation of the flick’s themes and its implications for its participants. “Wounds” seems a bit disjointed as it goes from reactions to the movie to critical notes to the experiences of the vets. It tosses out a mix of interesting insights but suffers from its lack of consistency. It ends up as a decent show but not a particularly insightful one. During the 25-minute and 31-second *One War, Many Stories, we get comments from Stone and veterans Dr. James Lull, Phil Weatherwax, Dennis Barberie, James Rice, Terance Duddy, Paul Gold, Bill Hutton, Odas Flake, Brad Fagerstrom, George Pyfrom, Harold Shrage, and Joey Leikin. The former soldiers chat about their experiences after a screening of Platoon. They relate their thoughts about the film’s depiction of events but mostly concentrate on what the war was like for them. This leads to a frank discussion and an emotional piece. Next comes a documentary called Tour of the Inferno. Originally created for a mid-Nineties laserdisc package, Tour of the Inferno is a 53-minute program combines film snippets, archival footage from the war era, “behind the scenes” snippets from the set, and then-contemporary interviews with a number of principals. In the latter category, we see Stone, producer Arnold Kopelson, creative consultant Dale Dye, and actors Charlie Sheen, Tom Berenger, Willem Dafoe, John C. McGinley, Forest Whitaker, and Johnny Depp. In addition, toward the end of the show, we hear some voiceover quotes from vets who provide their reactions to Platoon. 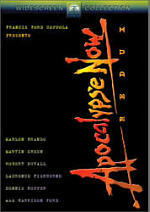 Directed by Charles Kiselyak, I found this program to provide a largely compelling examination of the film. The show proceeds in chronological order as we go from early training to the production itself to the film’s critical and popular reception. Although I thought it was interesting to learn of the cast’s “boot camp”, the best parts of the documentary focused on the shoot itself. This was a frank program that communicated many of the hardships and problems experienced during the making of the movie, and it offered a fine look at these elements. My only complaint stemmed from the virtually constant use of background music, which I thought was distracting. Otherwise, this was a terrific documentary that added a lot to my appreciation of the film. *Preparing for ‘Nam runs six minutes, 37 seconds and includes information from Stone as well as Vietnam veterans Hutton, Gold, and Lull. Stone only appears at the start, as the vets provide the bulk of the information. They discuss how they ended up in the military and relate their impressions of basic training. Despite its brevity, “Preparing” throws out some interesting notes and merits a look. A few other extras round out the DVD. We get a Behind the Scenes Photo Gallery with 27 fairly interesting shots plus a four-image Poster Art section. We also find the film’s original theatrical trailer, three TV spots, and a nice eight-page *collectible booklet that contains production notes. Finally, *Previews adds promos for “The Ultimate James Bond Collection”, The Great Escape, Windtalkers, “The Best of World War II Movies”, The Patriot, Raging Bull, and the extended cut of Black Hawk Down. As for Platoon, I continue to think it’s a good and often effective flick, but I don’t feel it’s a masterpiece or the best of its genre. The DVD offers pretty solid picture and audio as well as a strong collection of extras. This 20th anniversary release presents audio that seems the same as prior DVDs, but it improves the picture quality and adds some nice new supplements. If you want to get a copy of Platoon, go for this 20th anniversary set. If you already own the 2001 special edition, the 2006 release makes for a minor upgrade. I don’t know if it’s worth a double-dip, but you will see some improvement for your money.